Andrew Musselman, local cycling fiend and a dedicated Ride Civilian, whipped up his own Studded Tires in preparation for this weeks icy commutes in Seattle. Here’s a tutorial that covers a similar approach. Andrew’s using flat headed screws, with the pointy side out which makes a bit more intuitive sense. A tire liner over the heads keeps your tubes from popping. At least that’s the theory, how’d it go, Andrew? Anybody else riding studs this late fall? 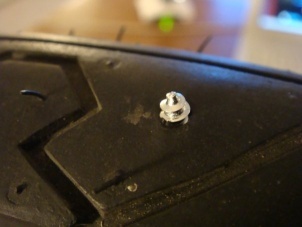 Here are the very, very short screws Andrew used for his tires. 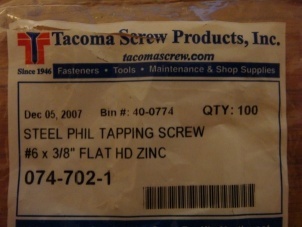 Available from Tacoma Screw Products and other fine screw product retailers, but maybe not at your local hardware store. Keeping the screw count low makes the tire assembly go faster I assume. 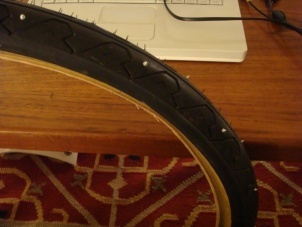 Looks good for commuting, maybe not what you’d want for trail riding in the ice.